James D’Arcy and María Valverde in Guernica. 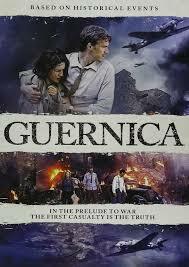 The setting is 1937 Spain, a year into the country’s Civil War and the people of the small Spanish village of Guernica are dealing with the day-to-day realities of the conflict, which includes the peoples’ choosing of sides between the left-leaning Republicans or Franco’s Nationalist regime. “Caught” in the middle of this is American journalist Henry Howell (James D’Arcy, Cloud Atlas), who secretly joins forces with a local press-office censor (María Valverde, Exodus: Gods and Kings) to work against the propaganda-fueled restrictions that are forced upon the press. The journalists’ inevitable budding romance and the politics of the region are wholly pushed to the side when Nazi Germany uses the village as a target to test out the effectiveness of the Luftwaffe and its aerial bombing techniques. Guernica is actually one of the first features ever made about its titular subject and the film best serves as a primer on the horrors of that terrible precursor to World War II. Filmmaker Koldo Serra comes from a mostly television background and he and his team get a lot of incendiary mileage out of the modestly budgeted war sequences. The “romantic drama part” is also deftly handled–the fire that ignites between D’Arcy and Valverde feels like a genuine one. Worth catching if only for the historical relevance.